Posted on Thursday, April 27th, 2017 at 9:17 pm. This 4 ingredient dessert is simply stunning. Mascarpone is sweetened with honey then topped with fresh berries and finished with sweet and tangy Blood Orange Balsamic Vinegar. Our White Balsamic Vinegars are tangy and sweet and make a perfect addition to sparkling water or a cocktail. Try our fruit spritzer and learn more ways to use vinegar in your favorite drinks. Grilling season is here! Check out our favorite BBQ sauces and marinades this weekend to get ready for Memorial Day. 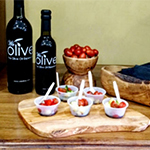 We Olive & the Paso Robles Olive Festival – Celebrating 10 Years!